Qualcomm CEO Steve Mollenkopf chats with QCampers in San Diego. 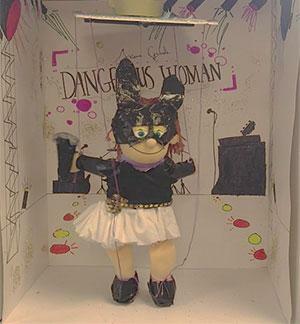 A wireless-controlled dancing marionette created by a Qcamper. 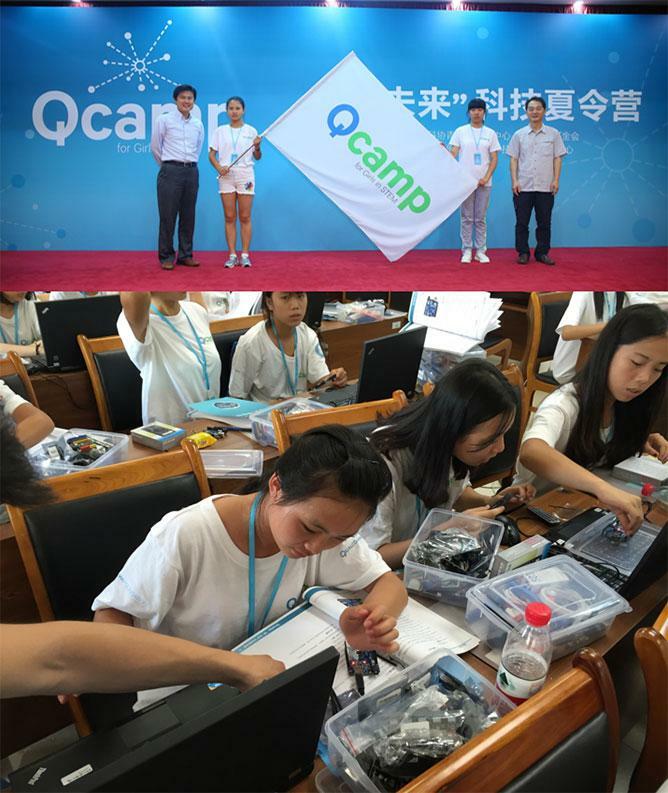 Scenes from the first QCamp for girls in China. After three summers of Qcamp for Girls in STEM, I am excited to report that the seeds we planted two years ago and continued to nurture in order to positively impact the way girls learn science, technology, engineering and math (STEM) education and careers have budded into female engineers of the future! Qcamp is a two-week, free-of-charge, intensive summer camp designed to introduce and solidify middle school girls’ interest in STEM. For six weeks over three summers, starting in 2014 when they were pre-6th grade, the same group of 30 girls who we recruited from the San Diego Unified School District attended Qcamp at the Qualcomm Thinkabit Lab. This includes the camper who moved to Northern California after the first Qcamp. Her family drives down to San Diego each summer just so she can participate. In fact, 100% of the original cohort returned every year which demonstrates the value that the girls and their parents saw in the program. All three summers of Qcamps were filled with fun activities, from field trips to places like UCSD’s Coordinated Robotics Lab and the CBS8 news station where the girls saw STEM careers in action; to visits from inspiring tech executives, like Qualcomm CEO Steve Mollenkopf who was curious to see what the girls were working on and our new Chief Information Officer Mary Gendron who spoke at the girls’ Qcamp graduation; to lots of coding and robo-crafting. As the girls acquired new engineering knowledge and skills, they designed and built progressively more complex creations. In year one, they created robotic hats for their capstone project. Year two, they created animated dioramas featuring a robotic animal. This year, they worked on a new signature project — wireless dancing marionettes that are controlled by a smartphone, using either the device’s buttons or in response to hand gestures. This particular project required the girls to make all the different technologies and components talk to each other, giving them an understanding of the internet of things. We also engaged with the girls throughout the year in between camps, inviting them to participate in activities such as small group mentoring sessions with Qualcomm employees and hackathons that are part of Qualcomm Women’s Collegiate Conference. We’ve been working with the University of California, Berkeley, on a longitudinal study to determine the impact of this program. Initial key findings suggest that Qcamp participation supports girls to develop the dispositions, practices and knowledge that enable success in future STEM learning experiences and that Qcamp has increased the girls’ intent to include STEM in their lives at home and in school. In fact, the girls love coding so much that even on the most challenging day of Qcamp, when they were working on their wireless marionettes and nothing seemed to be going right, they were happy, laughing, dancing around the lab and loving the challenge. Based on our success with these girls, we expanded Qcamp’s reach in 2016 and created Qcamp for Kids in STEM. Deepening our engagement with the Vista Unified School District (VUSD), who we partnered with to replicate our Thinkabit Lab at Vista Innovation & Design Academy, we worked with VUSD to recruit 30 pre-6th grade girls for a two-week camp and 30 pre-6th grade girls and boys for a one-week co-ed camp. We also held our first Qcamp for girls in China. Like our original group of Qcampers, all of these new Qcampers concluded their experience on a strong note, excited about engineering and asking to be invited back. Developed and implemented by Qualcomm and the Institute of International Education (IIE), Qcamp is part of Qualcomm’s three-year commitment to IIE’s Women Enhancing Technology (WeTech) program. WeTech aims to build a healthy pipeline of girls and women in STEM fields. Qualcomm is proud of being a lead partner in this initiative since its inception. 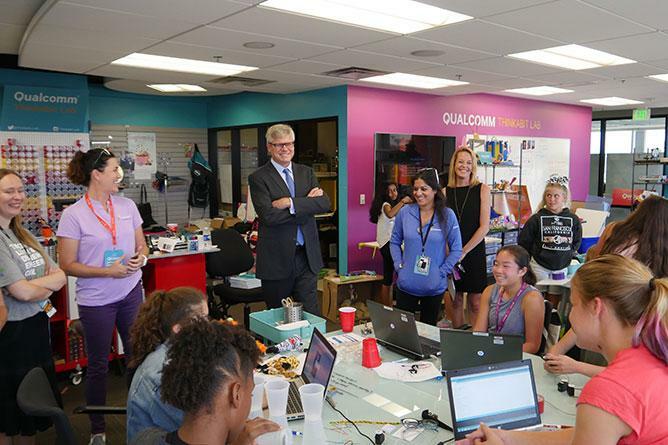 Qualcomm has been working on improving gender diversity in STEM education for several years, and we deeply value our public-private partnership with IIE on this initiative. It has enabled us to achieve so much more together globally than we could have done alone. I am incredibly proud of all our budding engineers and look forward to developing new ways that we can keep the relationships going and cement their interest in STEM. As Mary Gendron told the girls, When you work in a STEM career, you have amazing opportunities to improve people’s lives and help change the world for the better. With future engineers like these, the world is in good hands.